Facilities include free computer use and Internet access. There's also the free phone with ten numbers to useful organisations: North Warwickshire Borough Council, The Citizens Advice Bureau, Step Change Debt Charity, Job Centre Plus, Age UK, Seven Trent Water, NHS 111, New Central Credit Union, Warwickshire County Council and Volunteer Centre North Warwickshire. Call in and see what's on offer, stop for a cup of tea or coffee. Bags of fresh fruit with vegetables or salad items available each week. Small bags with vegetables £3.50. Small bags with salad £4.00. Family sized bags with fruit and either vegetables or salad items £5.50. Call in to order for collection next week. All produce supplied by the Smithy Farm Shop at Grendon. 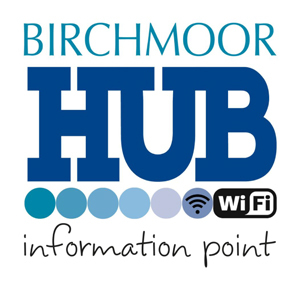 Birchmoor Academy Of Dance - Lessons on tap, mod, lyrical, ballet and acro on Tuesdays, Wednesdays and Thursdays for ages 2+. Contact Sarah Parker 07825 235532. Polesworth Aikido -Non-competitive Martial Arts training which improves confidence, fitness and well being. Friendly and informative classes of mixed abilities. Tuesday evenings 7.30 - 9.30pm. Contact Tony 07794 508632.